Being good at a sport is very different from coaching a sports team. Of course, most people who become sports coaches are very good at and highly passionate about that sport to begin with. Sometimes the most successful players of their heydays decide to coach the team of that sport instead of walking into the sunset and hanging up their sporty shoes altogether. It goes without saying that the number one rule of being a sports coach is to know and understand the sport like the back of your hand. When it comes to coaching a sports team, nothing is more imperative than motivation and tough love. The players need to know that you are in charge, but at the same time they also need to know that you care. There may be some days when you will have to be their friend and therapist; while on the other days you may have to really push them to unlock their potential. Being organized is a crucial part of being a sports coach. High energy levels, unbeatable discipline, ethical practices, being fair and wise, are all extremely important for one to be a successful coach. Your team has to respect you not just for your sporting skills but also for your training and motivational skills. Being biased or propagating any unfair methods can have a very negative impact on your team’s performance. Being dynamic in your approach is essential to keep things interesting and fun for your team. If everything is projected as a serious task, then your team will start deterring your approach at some point. The way you plan their training session is very crucial for a lot of reasons. It will not just help team members bond with one another, but it will also make them actually look forward to the training sessions instead of dreading them. Being innovative is a huge part of a sport’s coach’s personality, as the team members need to evolve from time to time and learn new skills. It is highly crucial for a sports team coach to be intuitive. A lot of the times, new team members may be relatively clueless about their key strengths. Or they may think they are good at something else, whereas their main skill may lie somewhere else. It is the coach, who has to not just identify hidden gems, but leverage their strengths for optimum team performance. Also, if each player is executing a role he / she is good at, it will actually increase the team spirit and reduce the chances of discrepancies. Instilling the right values in the team is another big part of a sport’s coach’s job profile. 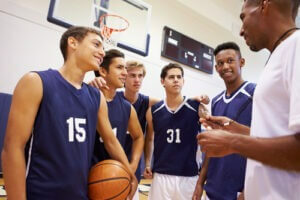 It is vital to remember that coaching a sports team is nothing like being a team leader in the corporate world. The concept of boss and subordinates doesn’t apply here. It is all about pushing people to give their best performance on the field and work in sync with each other. The relationship between a coach and his / her team is more like that of a mentor and mentees. Winning with grace, losing with dignity and never giving up are key elements, which need to be a part of a sport’s coach’s value system, so that he can pass on the same to his team. Being a sports coach can be a financially lucrative and an emotionally rewarding career for anyone who is highly passionate about a specific sport and has a natural knack for leading a pack. Bio: Charlie Brown is a free lancer content writer. He loves to play different sports like football, volley-ball, rugby etc. in his free time. This article will become more useful for all the players of a team those want to make their strong team. Also for all sports fans, a must read: Guide on the Greatest Sporting Arenas and Legends & News Report on Examiner.com on Sporting Disasters.